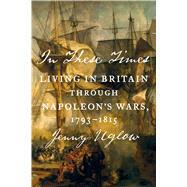 We know the thrilling, terrible stories of the battles of the Napoleonic Wars—but what of those left behind? The people on a Norfolk farm, in a Yorkshire mill, a Welsh iron foundry, an Irish village, a London bank, a Scottish mountain? The aristocrats and paupers, old and young, butchers and bakers and candlestick makers—how did the war touch their lives? Jenny Uglow, the prizewinning author of The Lunar Men and Nature's Engraver, follows the gripping back-and-forth of the first global war but turns the news upside down, seeing how it reached the people. Illustrated by the satires of Gillray and Rowlandson and the paintings of Turner and Constable, and combining the familiar voices of Austen, Wordsworth, Scott, and Byron with others lost in the crowd, In These Times delves into the archives to tell the moving story of how people lived and loved and sang and wrote, struggling through hard times and opening new horizons that would change their country for a century.